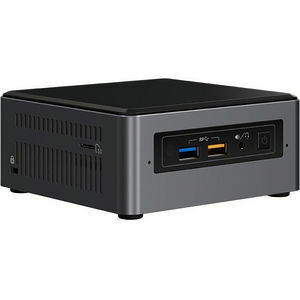 The Intel® NUC kit includes a customizable board and chassis that are ready to accept the memory, hard drive, and operating system of your choice. From home theater systems, to digital signs, find out how others are using the space-saving Intel® NUC in their home or business. The Intel® NUC is a Mini PC with the power of a desktop, packing features for entertainment, gaming, and productivity in a 4x4 form factor. With Intel® NUC you get an immersive media experience and responsive interaction while consuming a small amount of power relative to a full-sized PC. Due to its portable size and ease of installation, the Intel® NUC makes it easy to add devices and scale up rapidly based on changing productivity needs. Various configurations and features like Wi-Fi and extra ports give you the ability to add onto the Intel® NUC according to your specific performance needs.